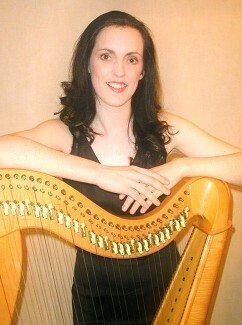 I began my harp studies with the late Sr. Eugene McCabe at Mount Sackville School in Dublin and I later studied with Fiona Norwood, Sebastien Lipman and attended masterclasses with the renowned harpist and teacher Edward Witsenberg. In 1992, I was awarded an Entrance Exhibition to Trinity College Dublin and graduated with an honours degree in Music in 1996. As an undergraduate, I completed my A.R.I.A.M. in Irish Harp and L.T.C.L. in Concert Harp performance. I also hold a Higher Diploma in Education (T.C.D.) a Masters in Musicology (with a specialism in Ethnomusicology) from University College Dublin and a Ph.D from the University of Limerick. I have won many prizes at competitions throughout the country and at the Dublin Feis Ceoil, I won first prize in all Junior and Senior Irish and Concert Harp competitions, as well as prizes in singing and composition (Dr. Annie Patterson Medal). I am a former member of the National Youth Orchestra, R.T.E. Cor na nOg, Belfast Harp Orchestra and have performed with many ensembles and orchestras (amateur and professional) throughout the country. I have appeared on R.T.E., B.B.C., C.N.N., and N.B.C. and have toured extensively with different groups throughout Europe, North America, Africa and most recently to Asia. I was a lecturer in Ethnomusicology at the V.E.C. from 2000-2005 and am an examiner with the Royal Irish Academy of Music, Dublin. I have also lectured at St. Patrick’s Training College, Drumcondra and at the University of Limerick.